Phasic gastrointestinal (GI) muscle is able to autonomously generate rhythmic contractions independent of the enteric nervous system. The electrical activity that generates these rhythmic contractions are called slow waves, or pacemaker potentials (PP), and they are produced by a specialised group of pacemaker cells called Insterstitial Cells of Cajal (ICC). Pacemaker potentials pass via gap junctions from the ICC to smooth muscle cells (SMC), activating L-type Ca2+ channels, Ca2+ influx and the contraction of the SMC. In the study described here, Jae Boum Youm et al. have developed a mathematical model which quantitatively describes the transmembrane ion flows and intracellular Ca2+ dynamics from a single ICC pacemaker unit. The model includes seven major currents that flow across the ICC membrane to transport three ions, Na+, Ca2+ and K+ (see the figure below). These currents include: the inward rectifier current (Ik1), L-type Ca2+ current (ICaL), voltage-dependent and dihydropyridine-resistant current (IVDDR), autonomous inward current. (IAI), Na+/Ca2+ exchanger current, (INaCa), Na+/K+ pump current (INaK), and the plasmalemmal Ca2+ pump current (IPMCA). It should be noted that the model described here in CellML is not identical to the published model. Instead, it represents the working model written in Matlab by Nandita Carvalho, who carried out an extensive literature review and had personal correspondence with the author of the original model Jae Boum Youm. On comparison, the final model was able to replicate experimental results and hence it was used to make predictions of slow wave characteristics of the small intestine. 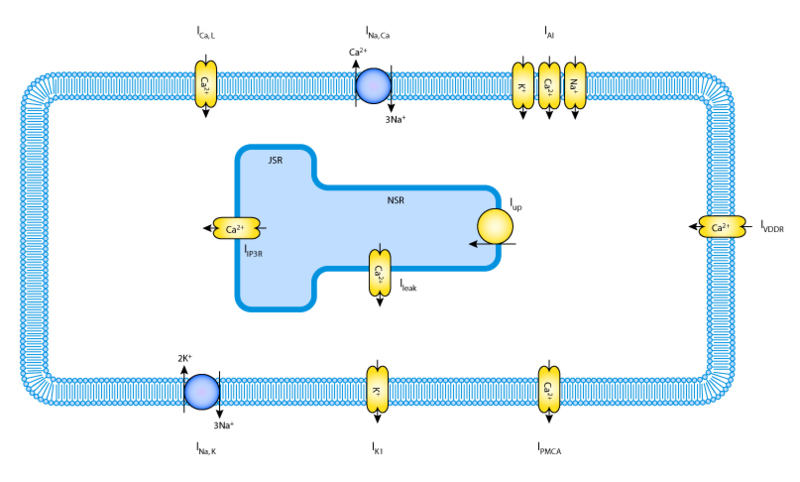 A schematic diagram of the cell model. There are 7 membrane currents. IVDDR is known to be responsible for propagation and its influx into the cell causes a slight depolarisation which increases the probability of Ca2+release from th SR through IP3-gated channels. This further depolarises the cell causing an influx of ions into the cell (via the pacemaker current IAI), which the initiates the slow wave. Derived from workspace Youm, Kim, Han, Kim, Joo, Leem, Goto, Noma, Earm, 2006 at changeset dbe9f3205087.